Call Now To Get Cash Fast! Pay for unexpected life expenses today. Our simple loan process is quick and easy. Reach out to us to learn more about our title loan services. Don't Know Where to Get Title Loans in Lufkin, TX? Nothing is more stressful than knowing you can’t pay for life’s unexpected expenses. It keeps you up at night, impacts your life and, sometimes, ruins your credit. Don’t let unexpected expenses ruin your life. Call us today to learn more about car title loans and eliminate the stress of unexpected costs. Are you unsure if a title loan is right for you? Do you know how safe and convenient a title loan is when you need immediate cash? If you need money but haven’t explored the option of getting a title loan in Lufkin, Texas, it’s time to take a look. Stop in anytime, no appointment needed. Get a free consultation with no strings attached. Ask us about our simple process, rapid services and low rates. Get the cash you need easily and quickly. Visit us today to learn more about our worry-free title loan services. When you visit JRM Title Loan, you'll never be judged or treated unfairly. We're your neighbors, and that's exactly how we'll treat you. Our title loans in Lufkin, Texas have the best rates in town. We understand cash gets tight when life throws you a curveball. Don't trust a stranger to help you get the cash you need for unexpected expenses. Stop by and see your friends at JRM Title Loan to get the money you need without the intimidation. 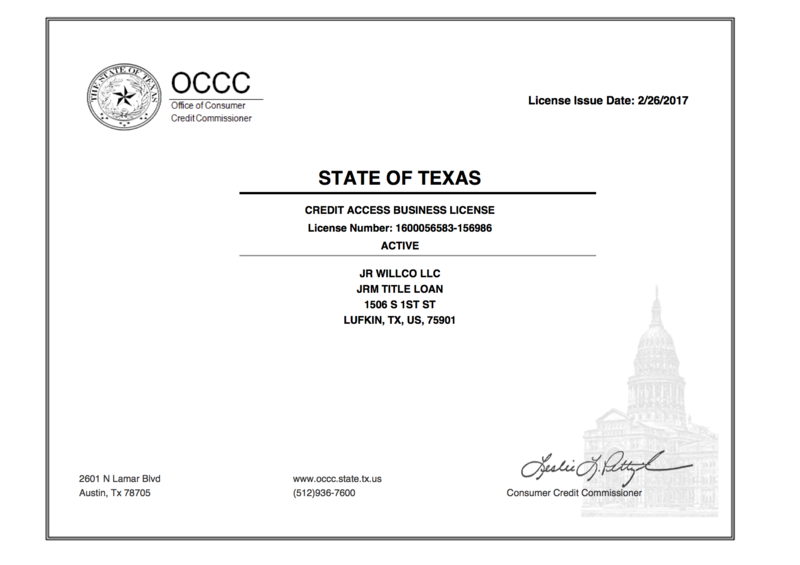 Copyright © 2019 JRM Title Loan, all rights reserved.